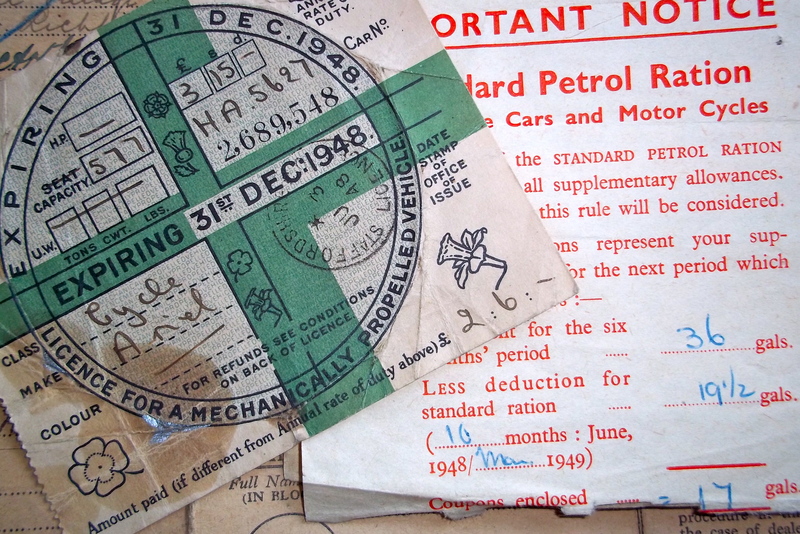 The vehicle that facilitated my parents’ meeting was manufactured in Birmingham in 1929, and according to its registration document, had been owned by Arthur Ball of Church Cottages, Wall, and W.J. Starkey, of Number 4 Council House, Lynn, before coming into my dad’s possession. Matrimony has many children; Repentance, Discord, Poverty, Jealousy, Sickness, Spleen, Loathing, &c.
Well how would he know? His connubial ambitions – a fascinating story in themselves- were thwarted, which perhaps explains his splenetic remarks. I would defy any long-established couple not to have a brush with at least one or two of the items on Dean Swift’s list, but for my parents, Ted and Marie Horton, the “children” of their union also numbered security, mutual support and appreciation, shared interests, a delicious sense of humour, and, after nearly thirteen years of marriage, one single, strange, human, offspring. It would have been their 65th wedding anniversary recently, and it was me who offered the bunch of her favourites – freesias, into my mothers hands on behalf of my father, because death, in the words of their marriage vows, parted them seven years ago. 27th November 1948. The bride, Rose-Marie Sheldon, wore a smart, dark pink coat, and chocolate brown suede ankle-strap shoes. In the “old” Lichfield Registry Office off Lombard Street, my dad’s next eldest brother, George, and his wife Rene, were witnesses to my parents’ wedding, and they were also the only two guests at the ceremony. NOT my parents wedding….My father’s brother, Thomas George Horton marrying his pretty bride Irene Bastin at St Peter’s Stonnall, in 1941 with full paraphernalia. Back in the summer of 1941, Rene had a traditional white wedding to George at Stonnall: she was veiled, she was bridesmaided, and there was only a matter of yards for her to walk on the arm of her father, Albert Bastin, from Church Cottage, Stonnall, to the altar. That day, the Hortons, (those who were not there early for the service, being already eternally green-blanketed under the turf of St Peter’s graveyard,) had just a mile or so to traipse, Sunday-bested, down steep banked Gravelly Lane from Footherley hamlet, and their family home at Keepers Cottage. But my parents’ was a mixed marriage, and it was bound to be the Register Office for them. My mother was a lapsed Roman Catholic, and from Walsall, with sisters and father still devout in the faith. At the opposite end of the Christian spectrum, my father’s mother’s childhood at the shop in Walsall Wood had been steeped in the Methodism her father had brought with him from the Welsh Marches. For his own part, my dad was, as he remained, pragmatic and agnostic. As a boy, he had sung for other people’s weddings in the church of St. John, in Shenstone…. and pumped the organ too – he was always a stocky, strong lad. It was the satisfying jingle of silver coins in the trouser pocket beneath his white surplice that had motivated him, and not spiritual reverence. Mother with some of her new female in-laws in the late 1940s. 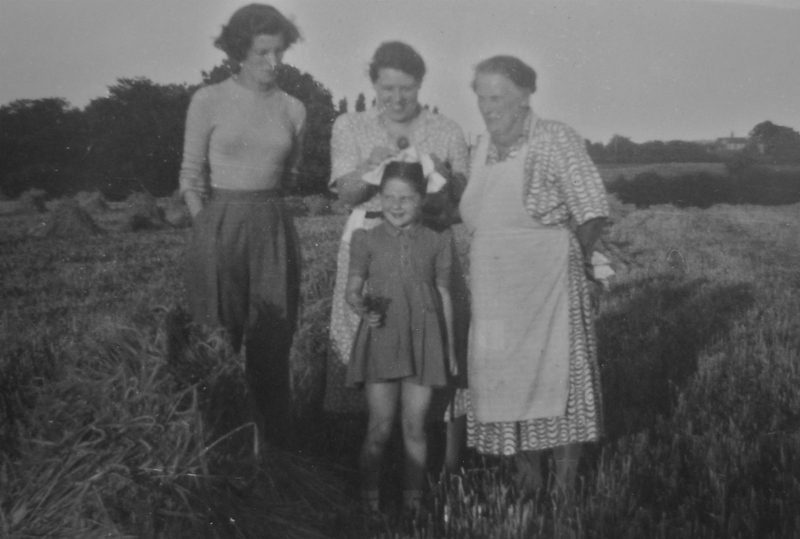 Among the stooks, in the cornfield behind Keepers Cottage, with the Owletts in the background on the right, are my Aunty Nelly with my cousin Josephine Ann, and my grandmother, Mary Elizabeth Horton, nee Blann, known as”Ma” – her pre-operation goitre very prominent. In the fine, mild, late November morning, after the happy splicing of my parents in Lichfield, the wedding party made their way back to Footherley, to the Hortons’ home, where Ma, always a competent caterer, having been a cook in service, had laid on a good spread. Pop, Ma, my dad’s brother Bill and sister Nellie, who still lived at home, welcomed my mother’s parents, who had come from Bentley to join the celebrations at Keepers Cottage. My (maternal) Grandad Sheldon, a pipe-fitter by trade, had travelled the country, going where work could be had, and had ventured abroad, too, in the very worst of circumstances, during 1914-1918. Granny Sheldon, on the other hand, would have been making one of her first visits to the countryside beyond the immediate environs of Walsall. Reassured by Aunt Mary, my Granny Sheldon is persuaded to touch one of the Owlett’s herd of Friesians, albeit gingerly. 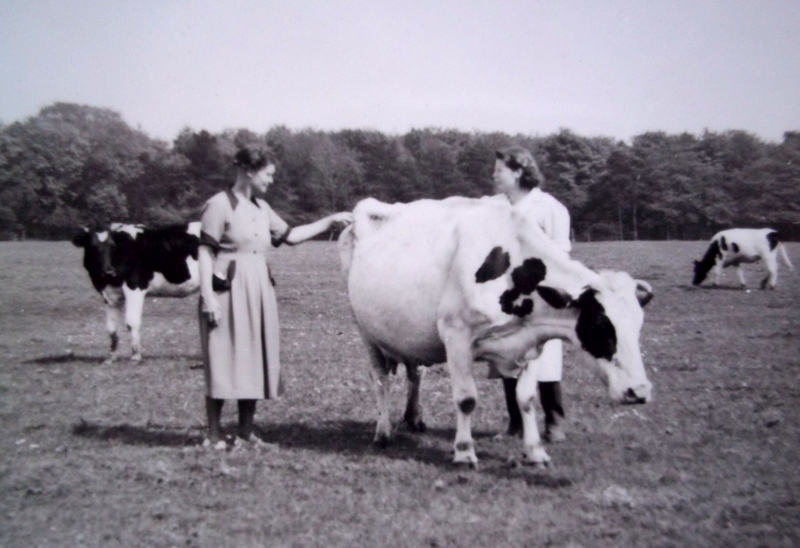 Everyone laughed, but only kindly, at how deeply suspicious she was of cows, even the docile little Dexters that her daughter Marie’s new in-laws kept in the field belonging to their small holding. She still trembled to remember the day when she had been shopping in Stafford Street in Walsall, and the barriers to the lairage at the abattoir had given way, rendering her a reluctant witness to a terrifying stampede. The party over, Bill took Edward and Elsie Sheldon in his motor, a chunky black Jowett, to the Stone House, on the Walsall/Lichfield road, at the end of Cartersfield Lane, to catch the ‘bus back to Walsall in the thickening fog that November evening. Meanwhile, the newlyweds set off on foot to Owletts Hall Farm, slightly disorientated by both the weather conditions and excitement, where Ted’s eldest sister Mary was waiting to congratulate them, and put them up for the night. No one was surprised at Mary’s absence from the wedding breakfast, given her bitter feud with Ma. “I don’t drink,” said my mother, obstructively, although it was, and remains, perfectly true that she doesn’t. “…..’Op on, and I’ll buy you a lemonade,” my father persisted, and, pillioned on HA5627, my mother was transported to The Boat Inn in that area along the Walsall/Lichfield road known as Summerhill, and into a new chapter of her life. Christmas 1947 came and went, with the Land Girls were still in keen demand on the farms around Shenstone. Some week-ends, Marie made her way back home to Walsall by bus. The Land Army truck might take her along the Walsall/Lichfield road as far as Streets Corner. At other times, Ted waved her off from the bus stop at the Stone House. As she was just about to negotiate her way to a seat one day, Ted, in his farewell, referred obliquely to the absolute certainty of their future marriage, and so they were deemed to be engaged. In September 1948, my mother’s Land Army career was, finally, at an end, and she got a job in the offices of Crabtrees, off Broadway in Walsall. Now, the journeys along the Walsall/Lichfield road were reversed. There were weeks at work in town for Mom, then each week-end the Arial was in service, greedily using up the petrol ration, as my dad fetched her back to the country, eking out their time together as the year rolled on, so that the return journey on Sunday was now being made in the dark. One time, in lashing rain, they set off on the Ariel from Keepers cottage back to Bentley, my mother furnished by Ted’s Ma with an ancient mackintosh, split right up the back. Near Aldridge, the bike conked. Marie had to board the bus there for Walsall, all vanity futile as she lowered herself gingerly onto the bench seat, bedraggled in the hideous black garment. Meanwhile, Ted had no choice but to push the cussedly heavy Ariel all the way home to Footherley. This was the final straw: the autumnal appointment with permanent mutual commitment was soon booked, and they hardly spent a night apart for the next half a century. 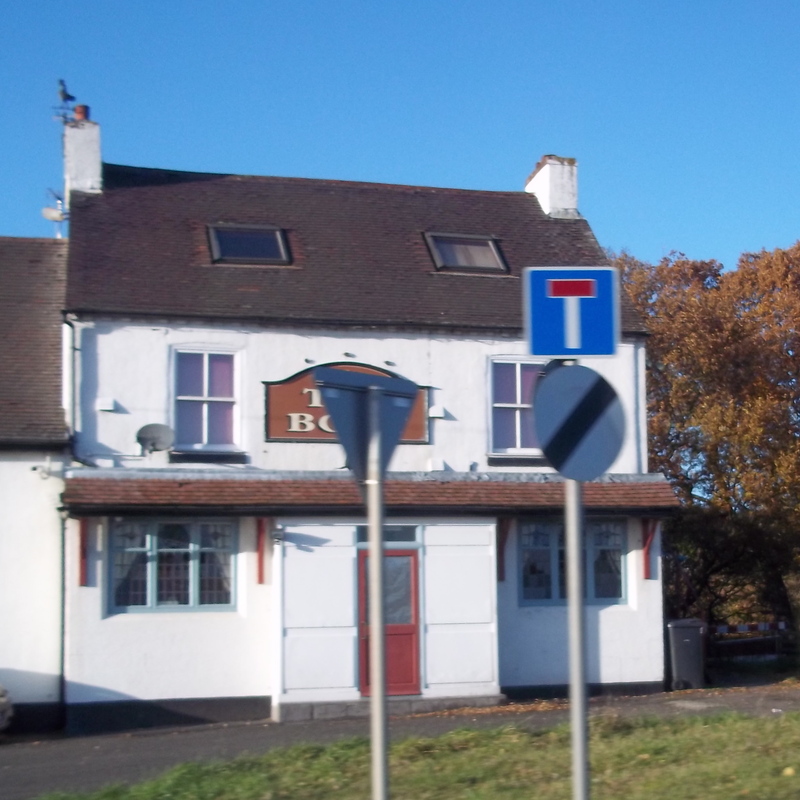 “The Boat” still stands, and still trades, at Summerhill, its atmosphere sadly defined by the busyness of the road it faces. In 1947, it was still, coherently, (considering its name,) adjacent to the quieter comings and goings of barges on the Wyrley and Essington canal beside it. Today, that waterway is a silted up memory amongst the trees, and the new M6 Toll road, 100 yards away, adds to the 21st century cacophony in the air from the Walsall/Lichfield road underneath which it passes. The site of the Stone House Farm now lies beneath the tarmac where the road was widened at the junction with Cartersfield Lane. We pass this way very often, Mom and me, and find ourselves exchanging a few words as a gesture of remembrance at these family landmarks. At Shire Oak Hill, as I wait for the traffic lights to change I sit poised equidistant between the twin loci of so many of the hatches, matches and despatches of my forebears. Travelling Southwest, the highest point of the hill is reached after the traffic lights, where the conurbation of Walsall (my mother’s end) is spread legibly before you. In the other direction, the spires of Lichfield Cathedral are visible ahead in perfect alignment with the road (my father’s family’s stamping ground). View a road map and you will see that the A461 Walsall/Lichfield road crosses the Chester Road at Shire Oak in a perfect saltire, like a great big kiss. The A461 plys both Northeast and Southwest from Shire Oak in a remarkably straight line all the way from Muckley Corner to Walsall Wood – in contrast to its gently waving shape as its limbs approach Walsall and Lichfield on either side. The mid 18th century account of the area by the Reverend Henry Sanders of Shenstone had it that this immediate area was densely wooded and, “until recently” a “den of thieves”. It is that woodedness – (also denoted by the name “Walsall Wood”) that accounts for the straightness of this part of the road. It speaks of (relatively) recent, post-medieval clearance through ancient woodland that was once part of “Cank” or Cannock Forest. Saxton’s 1577 map of Staffordshire shows no roads, but does show “The Shire Okes” as a place of significance. 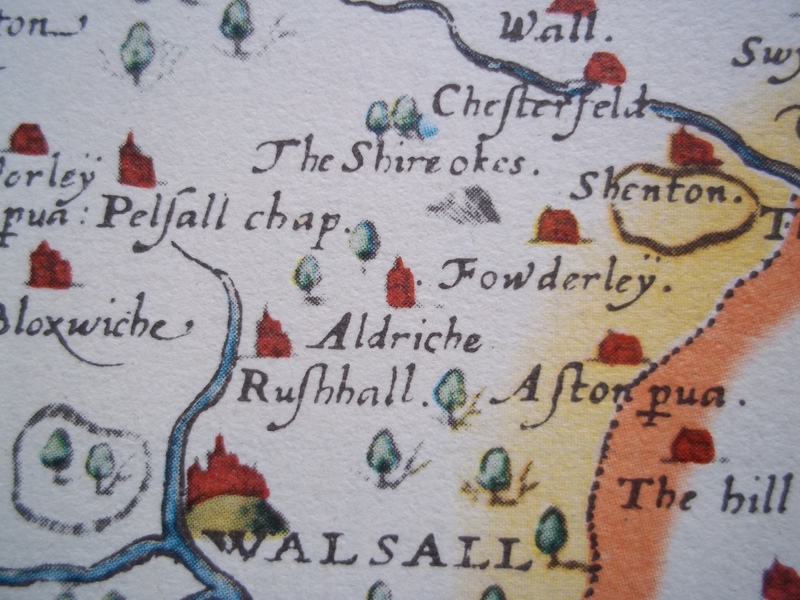 “Fowderley” – Footherley – (the spelling gives us an interesting insight into how it was then pronounced) – was obviously a much more significant settlement in Elizabethan times than it is now! My distant ancestors, I wonder? You know I can’t do maths….. The maths I can do….but, especially true in our family, the ancestors won’t be discrete, so the number won’t be as high as you would at first think…in one of many examples, Mary Shingler, nee Horton, born 1837, in Lynn, and her husband James, are our great great grandparents twice over. Back to “The Road,” ….she spent her widowhood, making a living a seamstress, in a dwelling next to what was The Leopard Inn on the Walsall/Lichfield road at Sandhills. Her married life, of course, in a cottage at the Stone House end of Cartersfield Lane. No wonder I have got all these damn-fool auto immune diseases!!! Brilliant piece of writing !! Thoroughly enjoyable. Thank you. I really appreciate your interest David, thank you so much. Lovely read enjoyed it very much indeed. Thank you. Appreciate your feedback, Clive. It makes the effort completely worthwhile.